LG is doing the deed for a share of profits in the smartphone market, especially with the launch of G2 that smartly defeats Galaxy S4 and HTC One in some benchmark tests. Released on Sep 6th, this smartphone did impress us a lot with its top-of-the-line processor and a myriad of useful features. Below are specs of the LG G2. The LG G2 packs a 5.2-inch screen with a 1920 x 1080 resolution that can handle any Full HD 1080 videos. Powered by Android 4.2, this Android phone is equipped with a 2.26GHz quad-core processor, 32GB of internal file storage (24GB accessible) and 2GB of RAM. What's more, LG G2 possesses a fairly impressive 3,000mAh battery better than that of Galaxy S4 at only 2,600mAh. Therefore, it gets you through an entire day without any trouble. With solid battery life, expansive screen, ultrahigh resolution and the fastest hardware packed in it, LG G2 undoubtedly gives you an ultimate movie watching experience. However, for DVD collectors, to play new DVD releases on LG G2 will not go easy. You have to rip DVD to LG G2 compatible format first. For homemade DVDs, Handbrake will be a good choice, while for commercial DVDs that are encrypted with CSS, Disney copy protection, etc, you will be recommended with a professional DVD ripper to suit your demand. Here MacX DVD Ripper Pro is highly recommended for your DVD to LG G2 conversion needs. It performs as the best DVD ripper for LG G2 on your Mac that helps to decrypt any copy protected DVD movies and copy DVD to LG G2/V20/G5/V10 on Mac OS with a couple of clicks. You can also touch up your converted movie by trimming the segment, crop the video to fit your LG G2 screen, and even add external subtitle at your disposal. Below we will show you how to decrypt DVD to make it playable on LG G2 under Mac OS X easily. Free download the LG DVD ripper for Mac(macOS Sierra/El Capitan also supported) and copy DVD to LG G2/V20/G5/V10 on MacBook Air/Pro/iMac etc. Mac computers. 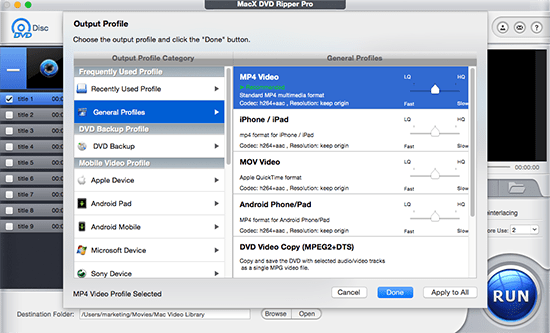 You are suggested to free download MacX DVD Ripper Pro on your Mac OS ahead of the DVD to LG G2/V20/G5/V10 conversion. For PC users, please go to the windows version of DVD ripper for LG G2. Install and run this LG G2 DVD ripper on Mac OS. Import the DVD movie you'd like to rip by clicking "DVD Disc" button or simply load DVD folder and ISO by clicking the relative button on the main interface. To rip copy protected DVD to LG G2 on Mac OS, you can choose to convert DVD to a format like MP4 that is recognizable by this phone. 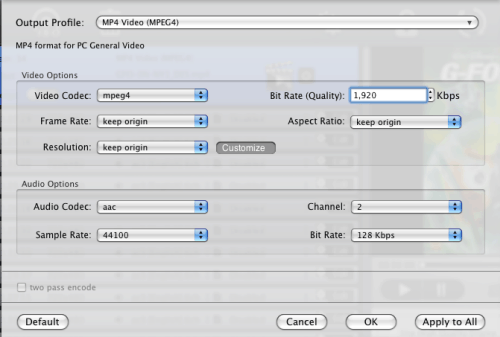 So from the pop-up small window, you can choose "PC General Video" --> "MP4 Video (MPEG4" as the output video format. And then click the "Done" button. Tips: LG G2 supports Full HD 1080 videos, so if you want to play new movie DVD releases on LG G2 with ultrahigh quality, you can tweak the video parameter as you need. For instance: Video codec (MPEG4), audio codec (AAC), bit rate, aspect ratio, frame rate, resolution (1920 x 1080), etc. With the above steps been accomplished, click the "RUN" button to start DVD to LG G2/V20/G5/V10 ripping on Mac computer, you could view the conversion progress and are able to cancel the converting process at anytime. The latest version MacX DVD Ripper Pro supports more than 180 output devices including the latest iPhone 7 and 6S. To be specific, you can feel free to rip DVD to iPhone 5S/5C/6/6S/7, iPad Mini, Samsung Galaxy S4/S7, HTC One, Galaxy Note 7, Google new Nexus 7, PSP, WP8, and more for watching on the go. After finishing the conversion task, you can take advantage of MacX MediaTrans to transfer the ripped DVD video from computer to iPhone iPad iPod for enjoying on the move. This tutorial shares a hassle-free solution to change DVD to Acer Cloud Mobile MP4 format, regardless of copy protection. With DVD to Cloud Mobile converter, you can easily play DVD movies on Acer Cloud Mobile anywhere anytime. Wanna rip DVD to Google Moto X on Mac OS for playback on the go? This DVD to Moto X tutorial introduces you the best DVD ripper for Moto X and lets you convert any copy protected DVD movie to a format playable on this Google's new gadget for watching anywhere anytime. Notice: We only advocate using this best DVD ripper to rip commercial DVDs to LG mobile phone under the concept of Fair Use and do not encourage any illegal reproduction or distribution of copyrighted content. Please abide by the local DVD copyright law before doing it.